Infrared thermal bond asphalt pavement patching is a method of blending new asphalt with infrared, in-place heated asphalt to create a joint-free integral patch. See the pictures below. 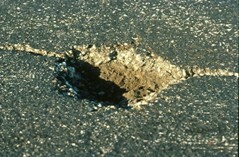 The machine can heat the asphalt, in-place, to a depth of about 3 inches without burning. There is no flame in direct contact with the asphalt unlike some competing in-place heating units. Infrared, meaning below red, is an invisible wavelength that carries heat. Our repair unit uses this to recycle asphalt in-place. It's heating elements produce intense infrared wavelengths that are directed into the asphalt surface. When the asphalt gets over 300 degrees it can be reworked, allowing new asphalt to be added, the surface leveled and rolled. More convenient: because you only need the infrared truck & a roller there is less disruption to your your business. Higher quality: because the surface is heated to over 300 degrees there are no new cold joints or sticky black goo between the old pavement & the new patch. Faster: depending on air temperature one 6 ft x 8 ft patch can can be completed in 10 to 20 minutes. The old method, involving sawing, digging out, hauling away and putting back new can take a day. Lower cost: Because it is much faster, less equipment & people are involved, the cost is usually substantially lower. Only use of indirect fired infrared units will be allowed. Direct flames are not allowed. 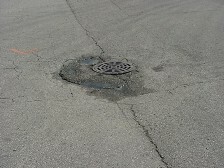 The asphalt must be heated to a minimum depth of 2 inches At least 3 cubic feet of new asphalt, that has had it's heat maintained at usable temperature, to be spread out uniformly on the surface of each 6 ft by 8 ft patch. A minimum of a 1 ton vibratory roller required to roll the leveled patch. Steps we take in the infrared asphalt patching process.